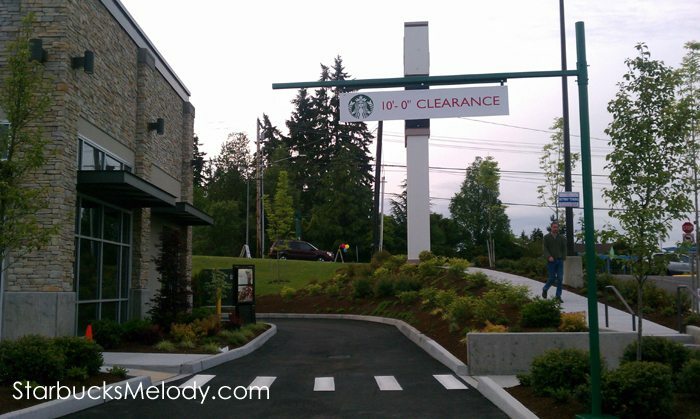 Today (June 17, 2011) is the grand opening of a brand new Starbucks in Lynnwood, Washington. Since there aren’t that many new company-operated new store openings in North America (compared to what it once was), I love showing off new stores here. And, it’s super fun to see the new logo hanging up in the window. 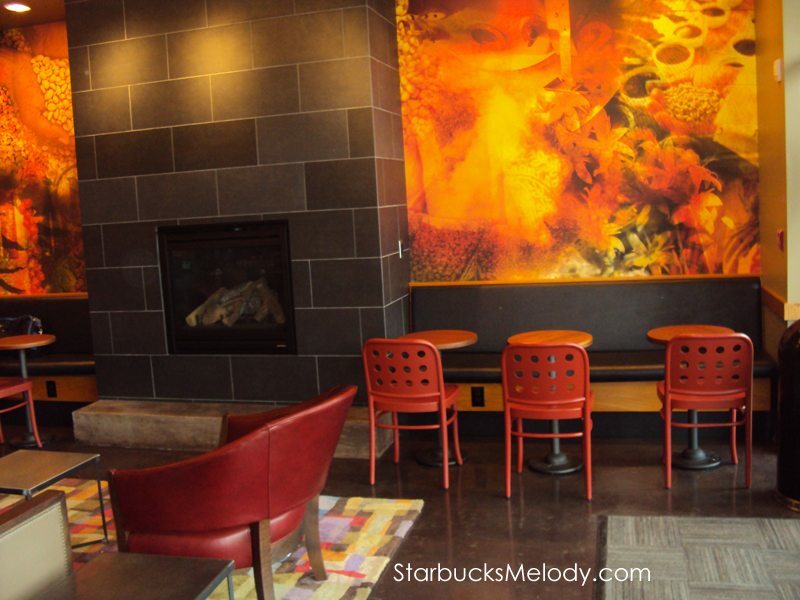 This new Starbucks has a fireplace, a large lobby, and it is a drive-through location. I noticed the rug in front of the fireplace – an unusual bright checkered pattern. I wonder if there is a story behind the rug. In celebration of opening a new store, all the partners were wearing white t-shirts with the new logo Siren on them. I thought it looked really cool! I wouldn’t mind seeing partners all wearing the new logo t-shirts at any Starbucks. I talked to a number of partners who were working, and asked the bar barista (“Hannah”) what her favorite whole bean coffee is. She replied French Roast. I too drink French Roast because my boyfriend really likes it, but I admit, I can quickly get tired of French Roast. I had a fine visit. The partners were friendly, I thoroughly enjoyed seeing a brand new store on its first day open. 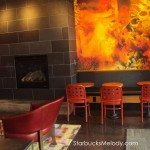 There have only been a few times where I’ve reviewed new Starbucks stores on the day the opened or very close to the day they opened. I managed to get to the Seattle Children’s Hospital Starbucks on its opening day. 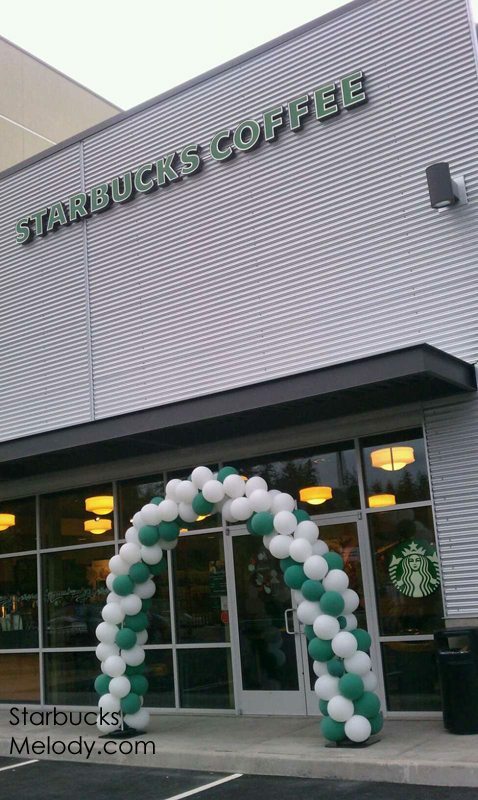 I also wrote about the new beer and wine Starbucks location in Portland, Oregon, having visited two days before it opened at a special preview party. 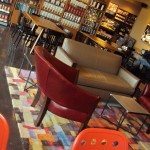 By random luck, I visited the Deer Park, Illinois, Starbucks only 12 days after its grand opening. (That store opened May 6, 2011, and my visit was actually Saturday, May 28, 2011, though I’m not sure I clearly said that in that blog post!). I went to a “media preview event” of the Roy Street non-branded Starbucks the day before it opened, and blogged about that store too. So enjoy the photos of this pretty new store. 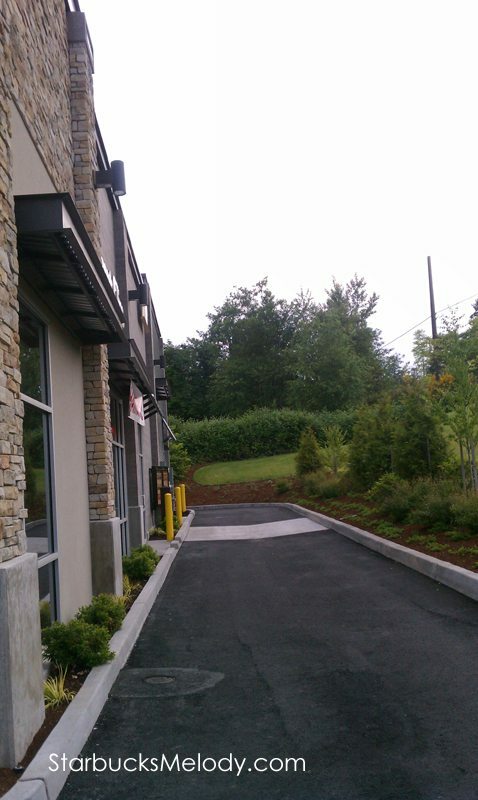 Since it is a drive thru location, I included a couple of drive thru pictures too. Sorry this post is a little bit short and sloppy! 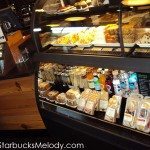 I managed to get this new Starbucks after work hours today, and typed up the blog post fairly quickly. The wall of the passionate design and placement of table and sofa. Customer can enjoy own time each. The interior gives healing to users. Very fun to see a brand new (on the day) store. I vaguely remember being at one on its 1st day open…’96. We were all so thrilled to have a Sbux a little closer to us. I think the rug is very interesting, too. I would also assume some history or really, I can’t see it as useful in a drink/eat place. Also, just a little ‘odd’ in its pattern I thought. The fireplace and walls (kind of embracing it) look really nice and inviting. I also really like those new white t-shirts on the partners with the new logo. I’d like to see that as a standard also. Thanx for the new store visit Melody! Ok it is not fair that these new stores are opening not near me!!! The fireplace and rug are just beautiful and this store looks like it will be a pleasure to relax in. Thanks Melody for sharing the opening and the pics. Again I ask when are these stores coming near me? Yay….a new store right in my neighborhood! It is undoubtedly registered as part of the Starbucks LEED Volume Certification Program since all new SBUX company owned stores are now designed and built in an environmentally responsible manner to meet the U.S. Green Building Council LEED (Leadership in Energy & Environmental Design) standards. Note to self….go see it soon!! @Nobrice – I always love your comments. The interior walls are really unusual since the back wall is mostly oranges and reds in color design. 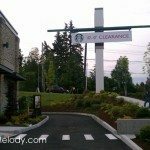 @Rachel – I think I’d heard that too – Starbucks has said that all new stores will be LEED registered, but I think I am only now really seeing it happen! They are really doing it now! When I was at the Roy Street opening 2 years ago, that store was a “pilot” for looking at how LEED stores might work. We’ve come a long way in 2 years. I feel proud! @Purple0022 – I am sure your cities will get these stores too. @Denise – You just reminded me of something. 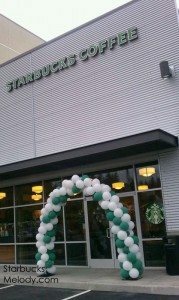 I remember being SOO excited when the Northgate (Seattle( Starbucks opened up. 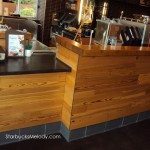 When I first discovered Starbucks, I lived in North Seattle, and I would drive out of my way to (meaning like just a couple miles LOL) to go to the Oak Tree Starbucks (Store #308) because that was the closest Starbucks to where I lived. 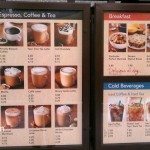 Back then, there were probably like less than 200 Starbucks total in the company. And then Starbucks opened up a store on Northgate Way and 8th NE which was really close to where I then-worked – At that time, only about one mile from work and home. I was sooo happy. I can remember going into that store when it was brand new and the excitement of it. I think that was 1994. I think there are still places that get that excitement for a new store. 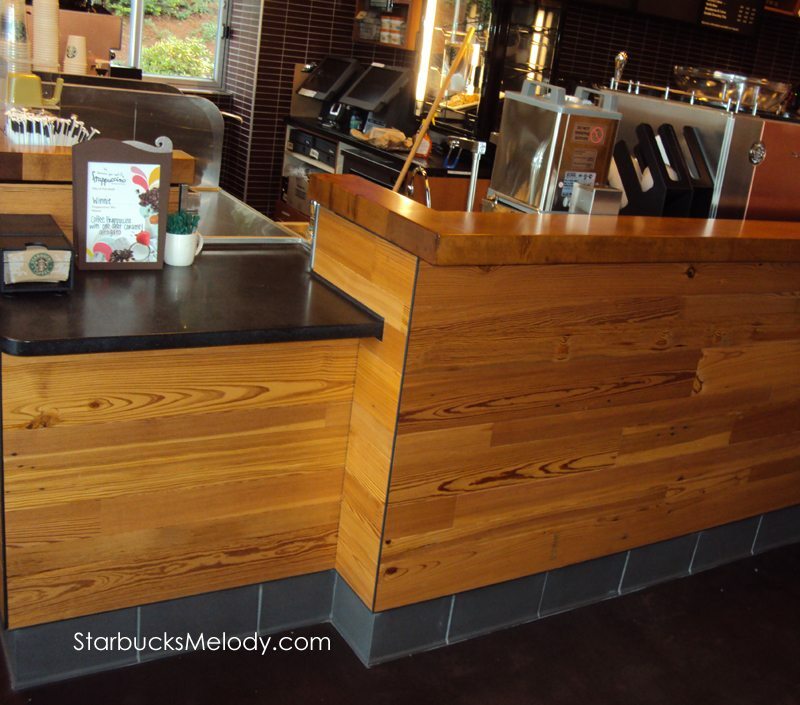 I love new openings…and haven’t seen pics of many openings in the U.S. 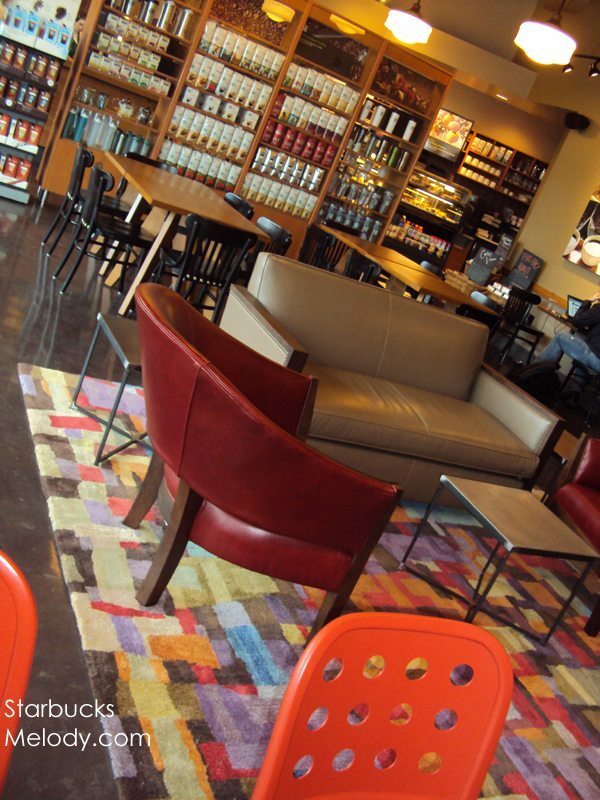 The store is really really nice and cozy…I love the warm colors of the interior and the fireplace. 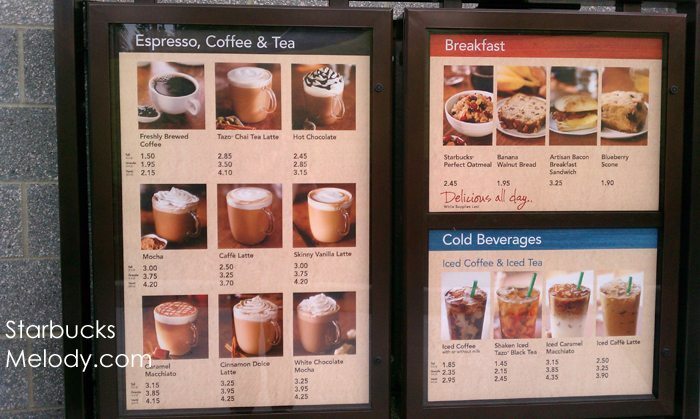 This is the first time that I see this kind of menu board at a Starbucks…is it new? PS: I am still wondering when Starbucks will release the official new logo polo shirts for us Partners worldwide. I heard some countries do have the new logo shirts alraedy…but most not. @Sebastian – I am pretty sure I know exactly the polo shirts that you mean. They are black, and the new logo is on the back of the shirt, up high at almost the neck. I have seen partners at my local store (the 101) wearing them, and I asked about them and two partners had gone together on a day off, and went shopping at the partner store at the HQ. Do you want me to mail you a few from the partner store? It wouldn’t be hard to do – I just need to know your size. Cool. I should be able to visit in July! 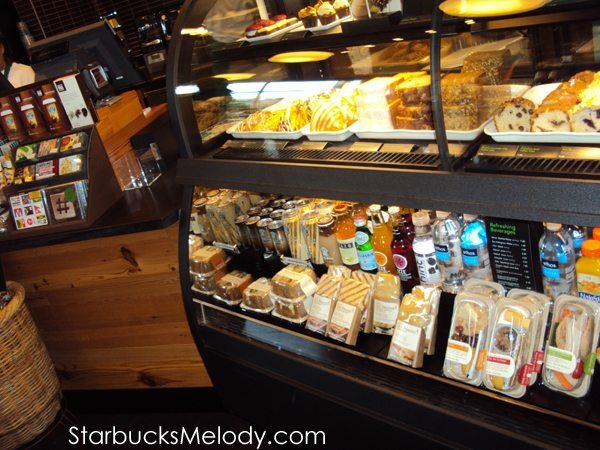 Melody, have you thought of doing a year-later followup on the new stores you have visited? Pioneer Square went through a major remodel and added a Clover brewer too. I keep meaning to go back there and re-review the store because so much has changed. Revisiting stores? Oh boy! That’s not even a consideration for me given the sheer number of stores. I’d never have time to do anything else. I do go back and rephotograph stores, to try and get the “perfect” shot of each store, and I often notice that the facade, trim, paint, etc, has changed. I imagine hundreds or thousands of my photos are out of date, but there’s nothing I can do without infinite time. Four stores in my district are undergoing remodels this summer. Three are occurring simultaneously because they all opened close together 5-6 years ago. Seeing your stories about these gorgeous new stores makes me a little sad because of how cookie cutter the stores are in my area. Hopefully, once the economy rebounds a little, we’ll be able to see a fun, unique store like this in the Central Valley. From an operational standpoint, I’m super-intrigued as to WHY there is a brewed coffee satellite at the cafe bar?? Is this for making caffe mistos? Hot water? 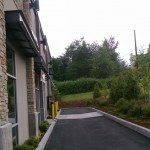 I can’t believe there wouldn’t be a better place for it closer to the drive thru area if it is indeed for DT brewed coffee. So odd. Dad Cooks what a great idea to do a followup a year later! 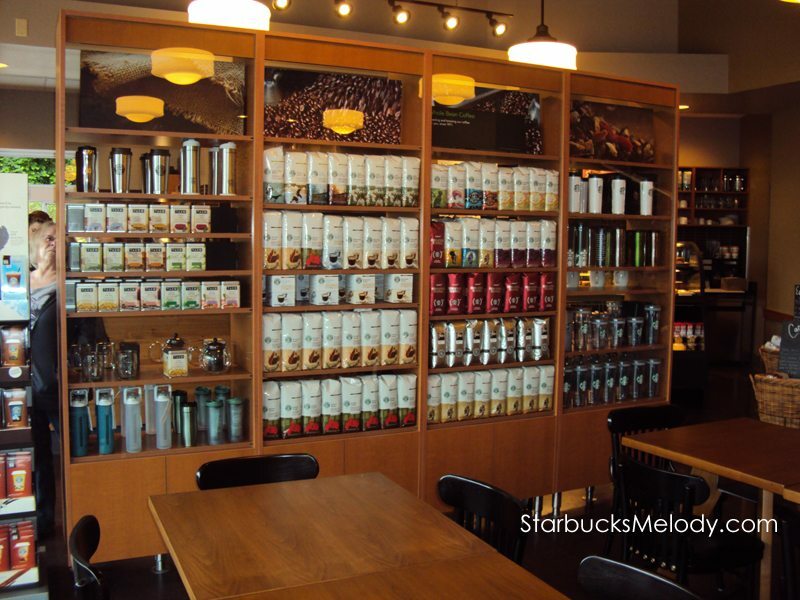 Would be very interested in seeing how well they maintain the store, how many customers there are, what the mood of the partners are, etc. @Jacob, I never noticed that brewed coffee urn there until you mentioned it. I should have! I guess it’s just misplaced? @ChrisW – I’m sure you’re going to get gorgeous stores too! 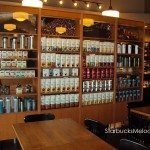 When I wrote about a couple of stores in Sacramento area that have the Clover – Gold River Starbucks and one in Sacramento with the Clover, they were both stores that had been through a major remodel and were beautiful. Wow, that does look warm & inviting. Will stop by if I’m up in the area! I love that there are no tiles for floors. I hate tiled floors. I love how welcoming this store is, but does anyone know if new stores are exempt from Siren’s Eye? There’s a lot of non-Siren’s Eye things going on here… not that its ugly. In fact, its quite lovely. Its so clean! I love it. @Cam – I wouldn’t image that a new store would be exempt from Siren’s eye. It could be that this store is out of whack because it’s new and still figuring out what goes where. I don’t think that I can just look at the photos and see what is out of whack. I didn’t even notice the coffee urn next to the Mastrena until Jacob mentioned it, and that does seem like an odd place to put it!